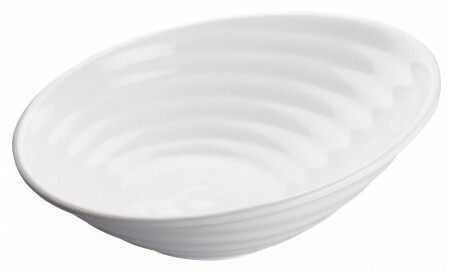 Winco WDM003-203 Ardesia Hailey White Melamine Angle Bowl 16"
TigerChef > Dinnerware > Melamine Dinnerware > Melamine Serveware > Melamine Bowls >< Melamine Serving Bowls > Winco WDM003-203 Ardesia Hailey White Melamine Angle Bowl 16"
$78.74 Winco WDM005-202 Ardesia Elista Melamine White Triangular Bowl 8"
$109.63 Winco WDM019-306 Ardesia Kaori Black Melamine Oval Bowl 9" x 6-5/8"
$159.93 Winco WDM019-307 Ardesia Kaori Black Melamine Oval Bowl 10" x 6-1/4"
$98.13 Winco WDM019-304 Ardesia Kaori Black Melamine Oval Bowl 8-3/4" x 5-3/4"
Serve entrees, appetizers, and specialty dishes in the Winco WDM003-203 Ardesia Hailey White Melamine Angle Bowl 16". Adding modern elegance to any table setting, this bowl boasts a crisp white finish that easily complements any dinnerware while its angled rim provides excellent product visibility. Perfect for both informal and formal dining, this NSF listed bowl captures the look of delicate ceramic without breaking the bank. Made from professional quality melamine, this bowl is virtually break-resistant and provides unparalleled durability and enduring strength.